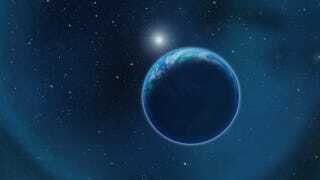 A team of astrobiologists has described a new method of detecting not just water, but life, on distant worlds. There's just one problem – the telescope we need to do it won't be on line until 2018. Heavy atmospheres (like Earth's) keep water from drifting off planet and into space, so astronomers like to look for them when searching for potentially habitable planets beyond our solar system. Now, researchers have found a new method for detecting heavy atmospheres around terrestrial planets that could host not just water, but life. The method is described by University of Washington astronomer Amit Misra and his colleagues in the latest issue of Astrobiology. The technique depends on the detection of "dimers," or molecules that have coupled together, in an exoplanet's atmosphere. In chemistry, a dimer is a general term that refers to any compound assembled from two identical smaller units. Misra and his team are primarily concerned with the presence of oxygen dimers. Since oxygen gas usually takes the form of O2, an oxygen dimer actually comprises four oxygen atoms, and is written as O2-O2. When a planet passes in front of its star, starlight shines through the planet's atmosphere and continues through space until it reaches us. Dimers in the atmosphere absorb light like a color filter on a camera lens, creating anomalies detectable once the pressure of the planet is at least 0.25 bars—high enough to hold down liquid water. The upshot is that the detectable signals Misra and his team describe will only show up if the atmosphere is pressurized AND well-oxygenated – and it turns out the only way scientists know how to make an oxygenated atmosphere is with oxygen-producing, photosynthetic life. In other words, if astronomers ever observe a planet with a strong oxygen dimer signal, it will likely serve as compelling evidence that that planet is home to alien life. But here's the rub: there are currently no planet-characterization missions on line that can perform this new method of atmospheric O2-O2 analysis. For that, the researchers say, we'll have to wait for the unprecedented power afforded by NASA's successor to Hubble, the James Webb Space Telescope, which is slated to launch in October 2018. Come on, 2018. Get here sooner. Read the full paper in Astrobiology.